I have a table with towns (polygons) and another with company assets (points). I am trying to get the town these assets are located in spatially. I have some point geometry that is contained within two polygons but I want to return only the inner polygon. I am using PostgreSQL and all of the functions (i.e. 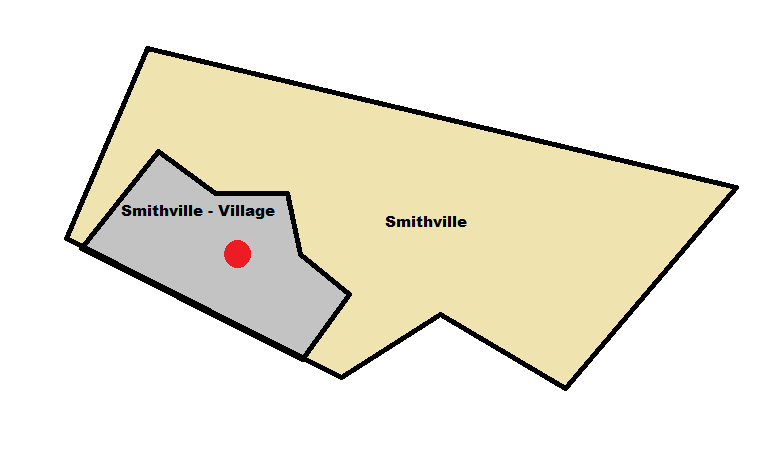 St_Intersects, St_contains) are giving me the same duplicate records where the point is showing up in both Smithville and Smithville - Village. How do I get only the inner polygon? . Needless to say you'll have to plug in the fields you actually want and whatever you need to do to make sure your geometry column is valid. This way you're joining in the geometry, then getting only the row with the smallest geometry. Not the answer you're looking for? Browse other questions tagged postgis postgresql polygon point-in-polygon donut-polygons or ask your own question. How to check a set of points are inside a polygon or not in postgis? Defining geometry types (point, polygon, geometry) in PostGIS?